In 2004, Drupad had his first opportunity to focus entirely on mime when he was told that Isabel de Santa Rita Vás required someone proficient in the art at IFFI. Following this venture, he felt the urgency to establish some sort of platform for mime in Goa. He took on many theatre folks to create an atmosphere conducive to the art form, but they were reluctant to take it on as a full time occupation because of the notion that it is not financially profitable. Go Goa Po Pondy is a society that has been started by Drupad in Pondicherry to act as a cultural liason between Pondicherry and Goa. Gomantak means land of light and therefore an office called House of Light has been set up in Auroville to establish the presence of Go Goa Po Pondy. However, for the idea to take root and be explored to its full potential it would require the active co-operation of the Government of Goa, which is unforthcoming in terms of participation or funds. Drupad recognises Goa’s gift of multiculturalism and wishes to build upon that base. ‘Had I been anywhere else, I would have been a mime artist. Goa made me because of its multicultural environment.’ He has performed at the Saturday Night Market, the Anjuna Flea Market and various restaurants and thus has been exposed to the reactions and responses of a multitude of cultures in the form of his audience. This is something he would never have had in places such as Delhi and Mumbai. The venue has great significance to an artist because in a mime performance an Italian and a Tamilian will not understand it in the same way. Trying to make an audience that is unfamiliar with a particular culture appreciate what certain gestures may convey is a laborious task that involves research and creativity. For example, a French audience has never seen water being drawn from a well as it is done in India. One needs to find gestures that would have the same connotation for them. Through his workshops and teaching sessions, Drupad has found that people everywhere react to mime in the learning process in much the same way. They seem to display similar flaws. It is only in Auroville… at the Sri Aurobindo International Centre of Education that he has encountered children who make different kinds of mistakes. ‘I was very excited to see these new mistakes,’ says Drupad gleefully. Since children are more supple physically and mentally they grow out of the mistakes, while adults take longer. Touching on the healing therapy through mime, Drupad believes that therapeutic benefits will come from anything that is done consciously, be it the arts, talking to parents or confidants and even life itself. The ease of mime and its minimal wear and tear on the body is the art’s advantage over something more vigorous like Russian ballet: a dance form that is highly competitive and wherein the dancers usually retire by the age of 40-45. 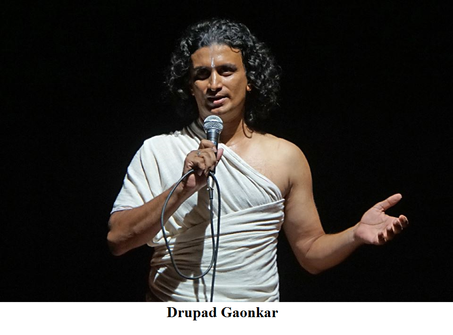 Drupad spent the whole of August 2015 in Goa, with workshops at Carpe Diem, Majorda and as guest faculty at Kala Academy’s School of Drama. Members of the Bharatiya Mukabhinay Natya Maha Sangh or the Mime Federation of India (Mukabhinaya in Sanskrit means Silent Theatre), have a policy of performing in different states just to show gratitude to the state from where they have come. 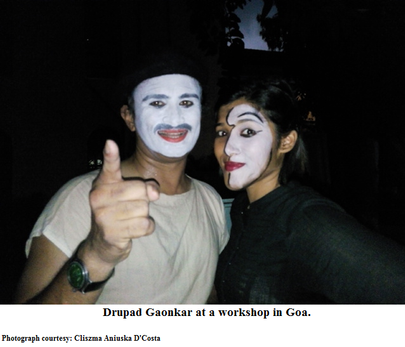 Drupad’s desire is to establish a mime institute in Goa, which will hopefully happen in another 2-3 years’ time. It is Drupad’s opinion that we stop exalting our parents to the station of gods. ‘God is everywhere,’ he says, ‘Get rid of notions like I, me and my family. It is amazing when done in the right spirit.’ Ironically, Drupad’s parents were broadminded and well off, which allowed him the freedom to pursue his dream. Though he did face negative comments on his choices from other people. ‘If it is no one else, then it will be your own hand putting your head in the water,’ he says, citing the example of a young mime artist who joined a BPO to make more money despite Drupad’s assurance that mime could fetch him money in lakhs of rupees if he continued with the art form. ‘I have chosen my air and I’m happy,’ says the man with a vision, stressing that a great deal of inner strength was needed to adhere to his decision. He encourages young artists to read the autobiographies of great men to draw on their courage and perseverance in life.